The familiar chuck-chuck-chuck of quail hiding in the weeds and scrub along the edges of a housing development remind us that nature is never far away. With 130 species scattered around the globe, the ground-dwelling small birds live on every continent except Antarctica. While quail will live next to humans if they must, they prefer tall grasses and scrub on hillsides and brush-filled canyons for their nests. Most quail species, such as the California quail (Callipepla californica), bobwhite (Colinus virginianus) and Montezuma quail (Cyrtonyx montezumae) scratch out hidden hollows in the ground under tall grasses or low-growing brush, against a tree trunk or near rock formations. California quail and Gambel's quail (Callipepla gambelii) will also build a nest in a shrub or tree if a secure platform is available. Lined with grasses, leaves and feathers, the nests are usually 5 to 7 inches in diameter and 1 1/2 to 3 inches deep. From September until April, quail flock together in coveys. In spring, mating rituals begin, and in April, May and June, the birds build nests and lay their eggs. An average clutch is 10 to 16 eggs, although some species may lay up to 28 small, speckled eggs. The eggs hatch in 21 to 23 days. If the first nest is unsuccessful, California quail will make a second attempt during the summer. Generally the female sits on the nest, although the male will continue incubate the eggs if the female leaves or is killed. The quail's preferred habitat is amid wild grasses, scrub, brush and open woodlands. A few species, such as the gorgeted wood quail (Odontophorus strophium), live in forests. Quail eat mostly seeds, berries, fruits and insects, foraging along the ground under the grasses and brush. Most quail species rarely fly, preferring to run along the ground or, when startled, leap into the air in a quick burst of flight. The California quail has been clocked at 12 mph on the ground and up to 58 mph in the air. 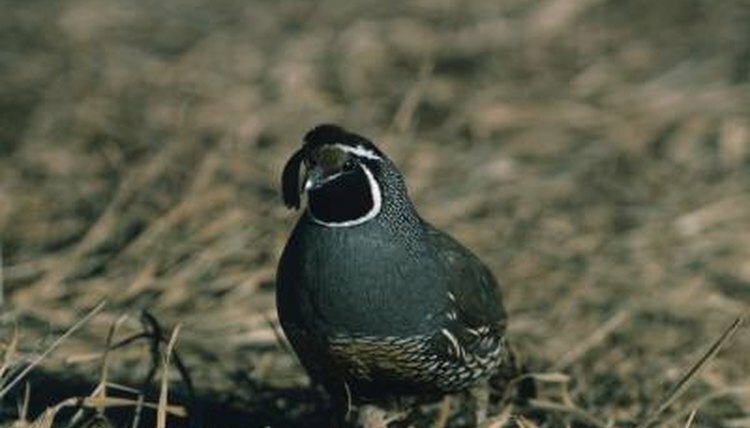 While most quail species have been impacted by loss of habitat, only a few species are endangered. The population of gorgeted wood quail, native to the Andes slopes in Colombia, is estimated at less than 3,000 mature birds. Logging, the conversion of forest to agriculture and hunting have affected the birds' population. Australia's buff-breasted button-quail (Turnix olivii) is also endangered, at approximately 500 birds. Loss of its grassland habitat and feral cats are among the reasons for its decline. The critically endangered Himalayan quail (Ophrysia superciliosa) is close to extinction, with less than 50 mature birds left in the wild.